Collapsible camp bucket that does it all! Storage space is limited when camping by boat, so the stuff that you bring needs to do more than one thing! 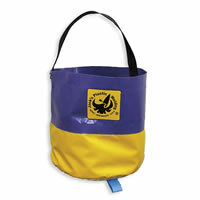 Made from heavy duty welded PVC boat fabric Jacks Camp Bucket features a 5 gallon capacity, a comfortable handle made from webbing, and a handy bottom grab loop. Its many uses include "shopping" down at the boat for food, washing dishes, and as carry-all for all your beach essentials. The best part about it is that it's collapsible and folds up for easy storage. They come in an assortment of fun colors so its like a grab bag when ordering; you don't know what color you'll get until you open the box! From Anonymous of Little Rock, Arkansas on 1/2/2016 .